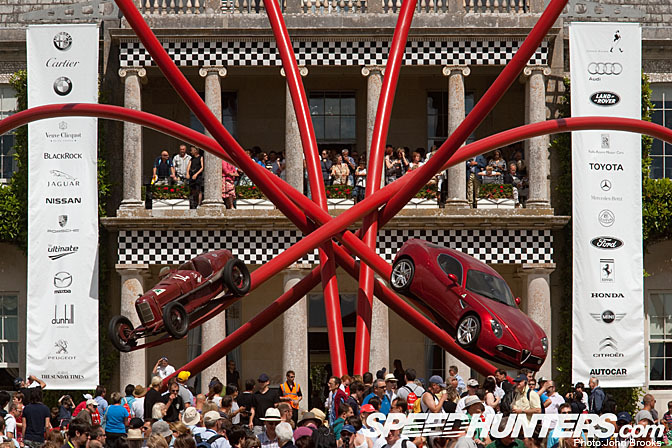 This was the theme for the 2010 Goodwood Festival of Speed. 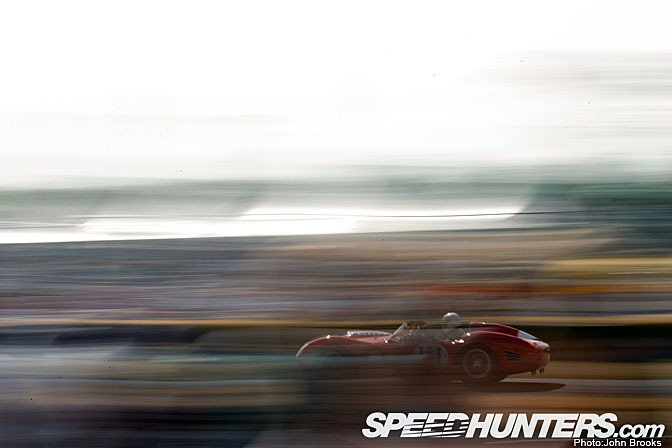 So as SpeedHunters, we all share "the passion for speed" that is typified by the Italian approach to cars and car culture. Therefore I am taking a closer look at contribution to the Festival from Italy, from Ferrari with their 2010 Formula One car (actually 2009 thanks to the FIA rules) to the Fiat S74, a 1912 Grand Prix winner in the USA. Somewhere between this motoring prima piatti and la dolce lies the celebrations for Alfa Romeo's big birthday. Not sure whether Her Majesty has sent the telegram yet but she should. 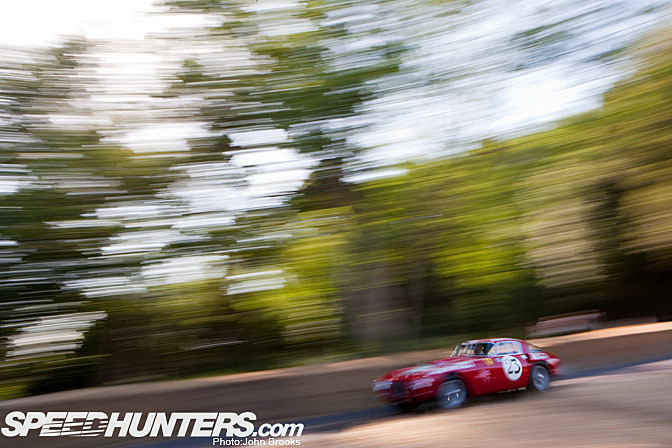 There was a fantastic collection of Alfas at Goodwood. This is Tipo 33 Periscopica from 1967. And how can one speak of Le Bella Macchine without a Maserati being included in the mix? 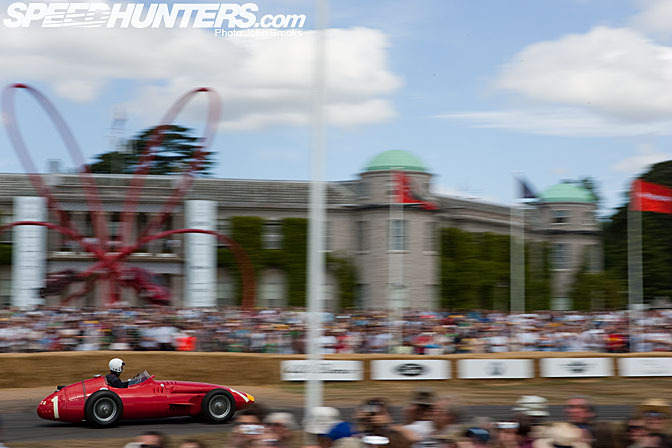 A 250F is something special but this example that is speeding past Goodwood House is way beyond that. 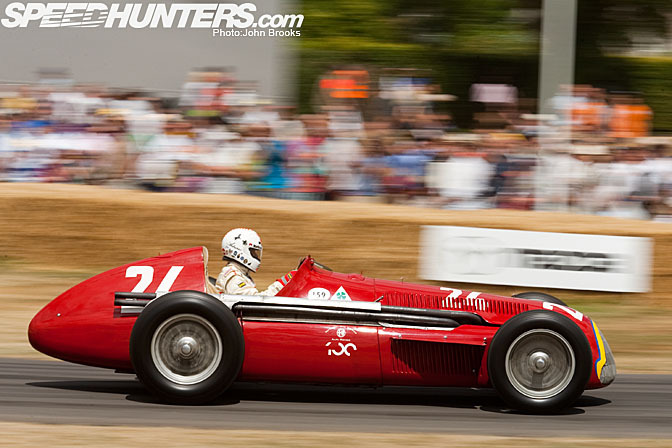 It is the car the Juan Manuel Fangio took to victory in the 1957 French Grand Prix. That in itself would be enough for most machines but it also the car that the Argentinian Champion scored his final and greatest win at the Nurburgring a month later. This sealed his fifth World Championship, no wonder his fellow drivers respectfully called him El Maestro. 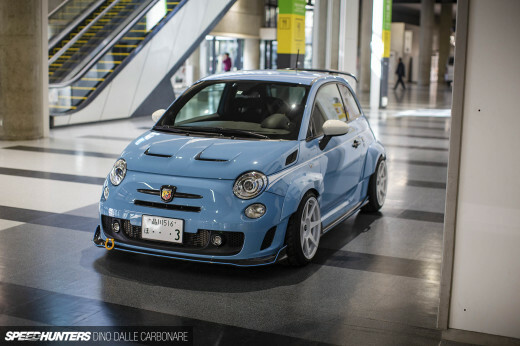 But the Show is not all about Formula One and Supercars, the Italians have brought flair and speed to the masses, building affordable cars with real attitude. 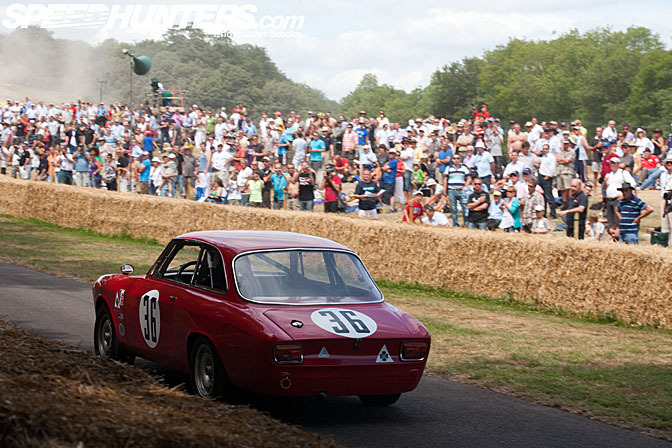 This Alfa Romeo 1600 GTA speeds up the Hill past the throng of enthusiasts who appreciate the style of the 60's classic. 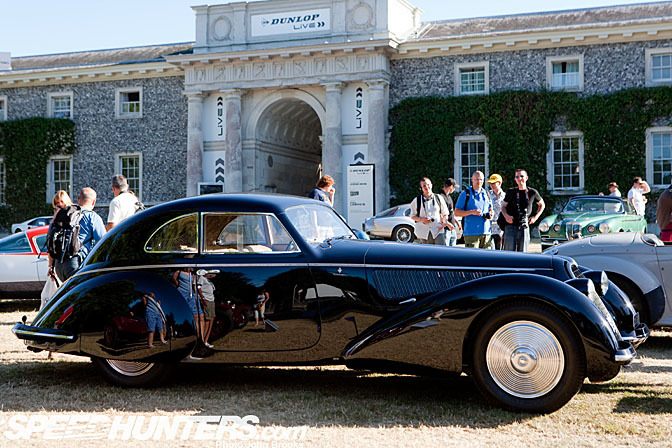 On the lawn, outside Goodwood House, a Lancia is on display. 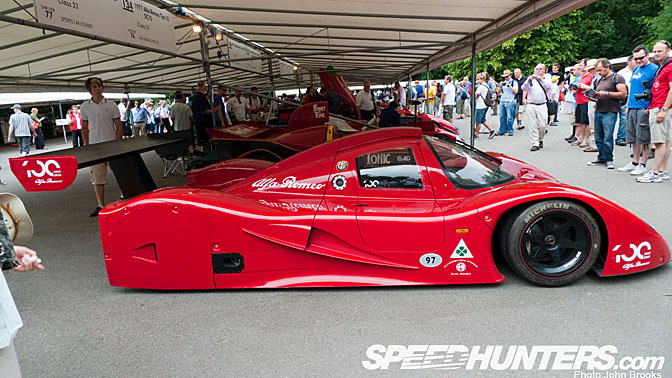 Just when you think you have seen it all……………the Alfa Romeo SE 048 SP, a 3.5 litre V12 prototype destined for the 1991 FIA Sportscar World Championship. It never raced, apparently it has the looks but not the speed. In any case, the political wranglings in the Endurance arena at that time would scare away all potential entrants, that and the massive escalation in costs. I looked at this in more detail a while back, HERE The Alfa has never been seen outside of the factory before, hen's teeth indeed. 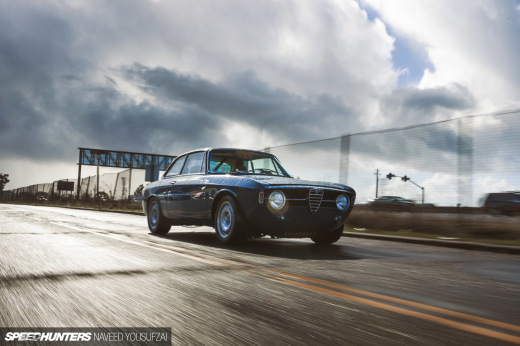 Looks like another ordinary 164 Alfa. However it has a 3.5 litre V10 shoehorned into the engine bay and is in fact a full blooded racing car. It is evidence that even Bernie Ecclestone can misjudge the market. In 1988 he came up with the bright idea of a shilouette racing to support the Grand Prix circus. 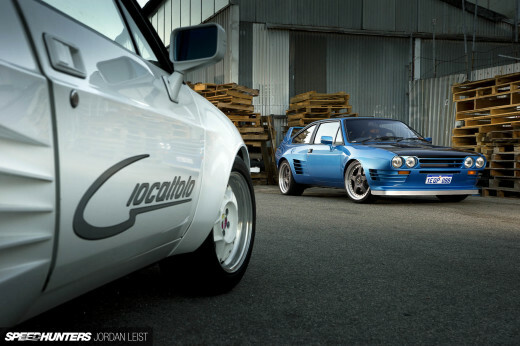 It would be called ProCar and the manufacturers would race cars looking like those they actually sold, plus the engines and running gear would be much the same as would be found on the Formula One grid, making some cost savings. All sound, logical thinking but the series failed to capture the imagination of the various marketing departments. 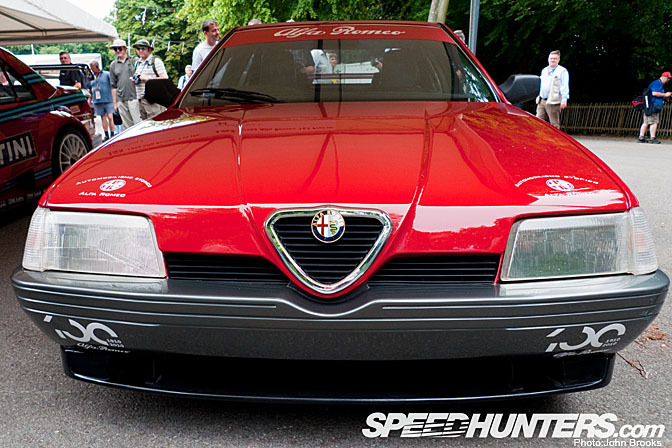 Bernie and Alfa Romeo had been partners in F1, so they collaborated to build up the one and only ProCar. It was very fast and very wayward. Ricardo Patrese topped 210mph testing at Monza but like SE 048 it was destined never to race. 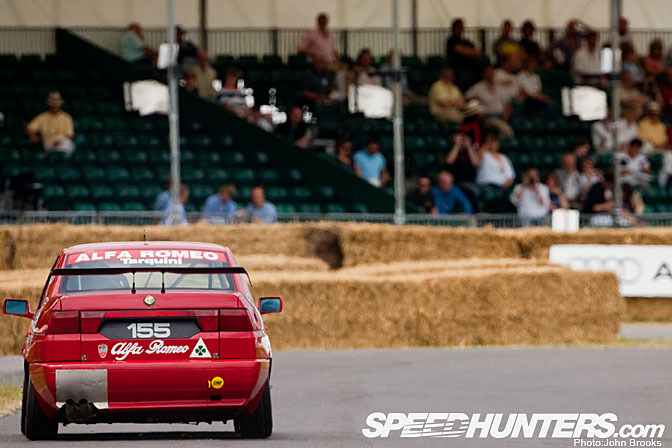 One Alfa Romeo that did race and very successfully was the 155 TS. In the 1994 British Touring Car Championship, Gabriele Tarquini won 8 out of the 21 rounds to take the title against strong opposition from the likes of Alain Menu and Paul Radisch. 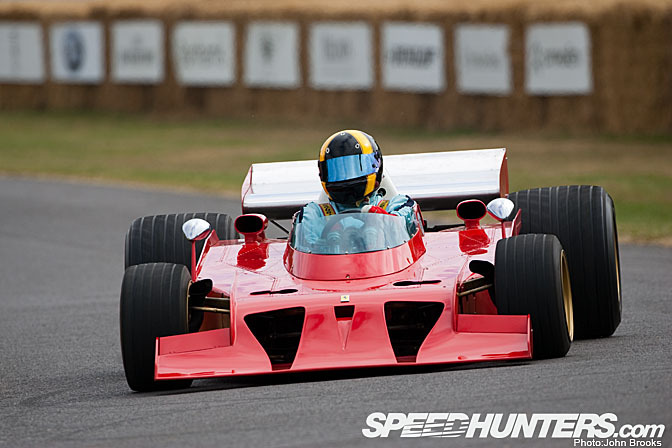 Another red car that did not race was the Ferrari 312 B3S 'Spazzaneve'. 1973 was one of the low points in Ferrari's competition career and this was an attempt to improve performance, without success. 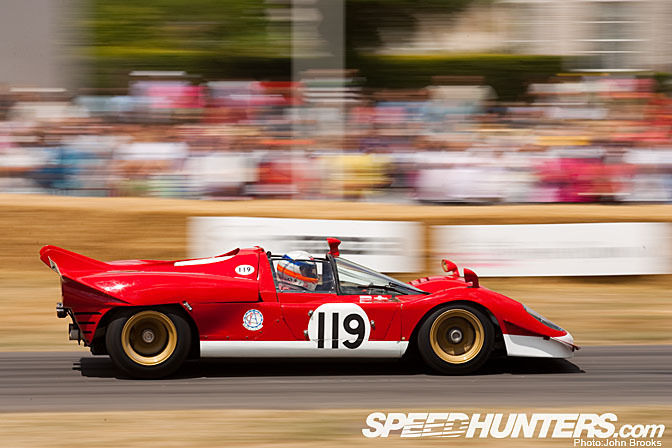 One of the stars of Steve McQueen's Le Mans film, the Ferrari 512S, was reunited with an old flame, Derek Bell. 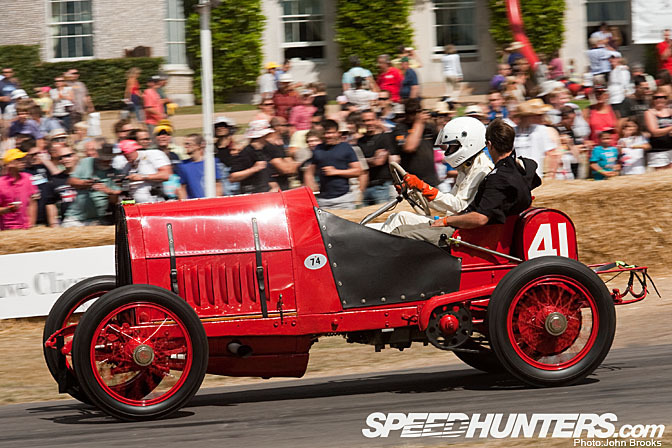 4 cylinders, 11.4 litres and dating from 1911, the Fiat S74 Grand Prix was a winner before the First World War. Completely contemporary, 2009 Ferrari F60. Another 33. 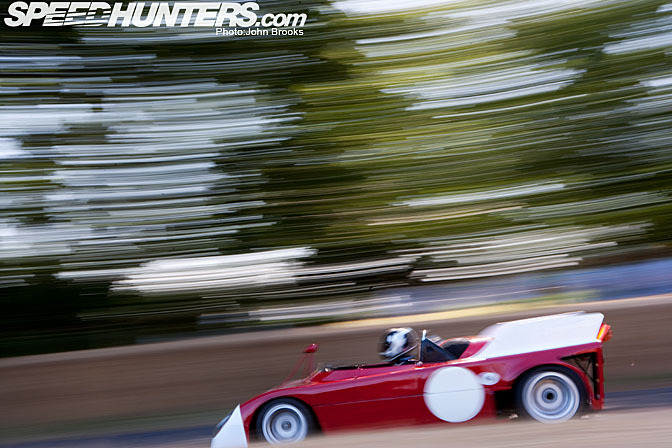 This one, a Tipo 33/2 Spider Prototipo was a 1968 factory car. The 33/2 was modified for Le Mans and took a class win as well as 4th, 5th and 6th overall. Eight years prior to that, this Ferrari 250 TR59/60 had won outright at Le Mans in the hands of Olivier Gendebien and Paul Frere. One of the crazier competitions ever to take place was La Carrera Panamericana, which was a road race in Mexico, around 2,000 miles in length. At first glance a Ferrari 375MM Berlinetta might not be the weapon of choice but in 1954 a second place overall was achieved. Down in the SuperCar enclosure a Ferrari 599 GTO returns after running up the Hill. 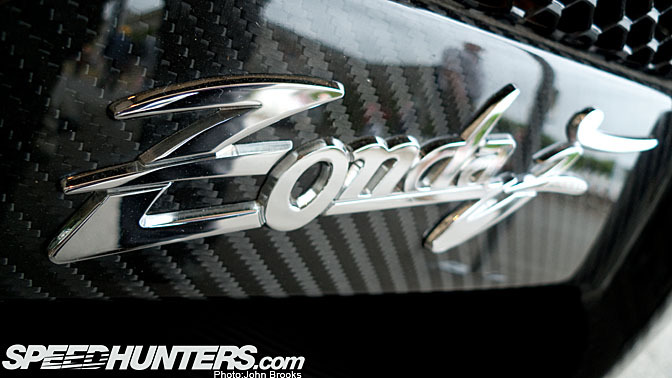 An oriental touch to the Pagani? 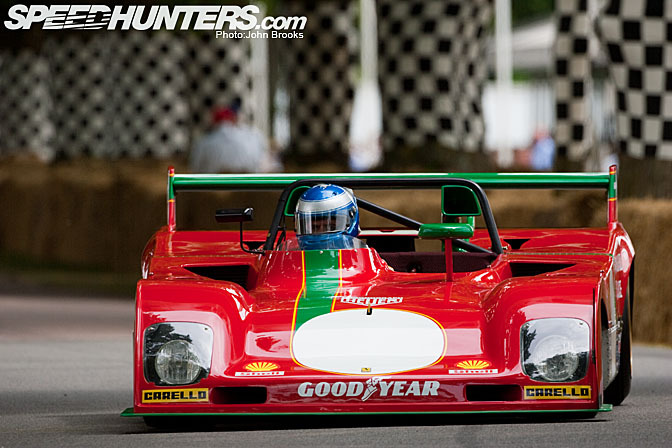 My old mate, Paul Knapfield, in his exquisite Ferrari 312PB. Exquisite, elegant, splendid, beautiful…………..the words tumble right out for this Alfa Romeo 8C 2900 Touring Berlinetta. 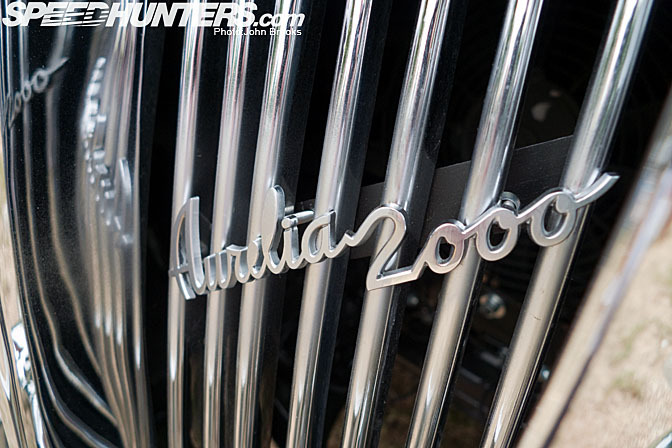 Dating back to 1937, it was the SuperCar of its time. A 2.9 litre supercharged straight 8 engine powered this streamlined Bella Figura. This was not just a pretty face, the 8C 2900 won the Mille Migla outright in 1938 and 1947, plus led Le Mans by a country mile (160kms to be exact) in 1938 till a broken valve forced retirement. Viva Veloce! This car went for £5.5 million at auction two years ago. Chris Evans, an "entertainer", stumping up the cash to buy a 250 GT SWB California Spyder, once owned by James Coburn. 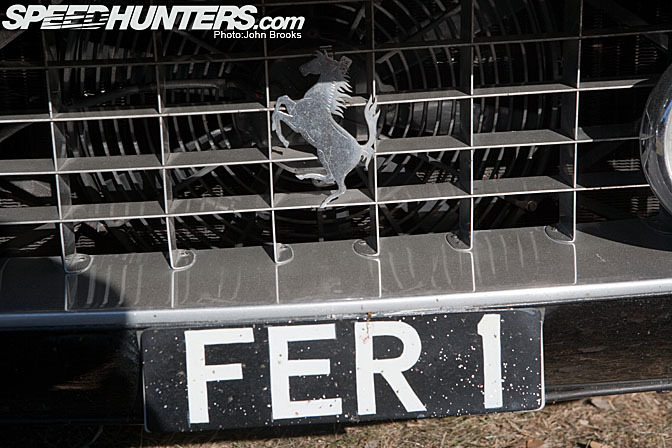 Chris brings some of his Ferrari collection to Festival for us all to enjoy. 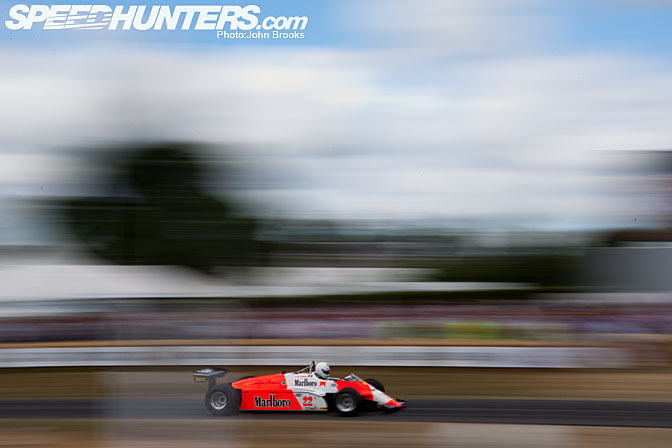 From a brutal time in Formula One, the Ground Effect era, the Alfa Romeo 182. 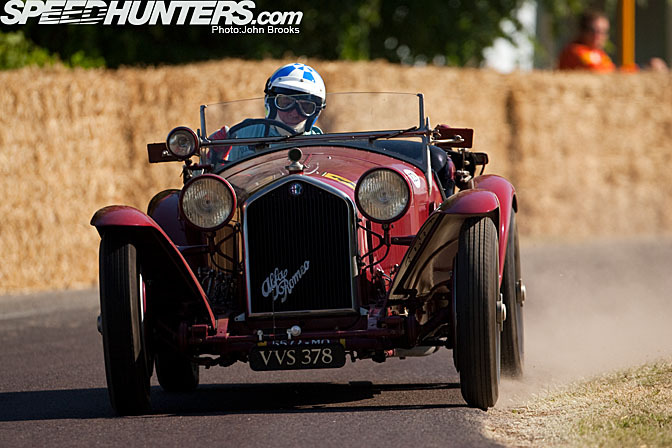 Still pushing hard at Molecomb, this Alfa Romeo 8C 2300 Monza was originally run by Scuderia Ferrari. 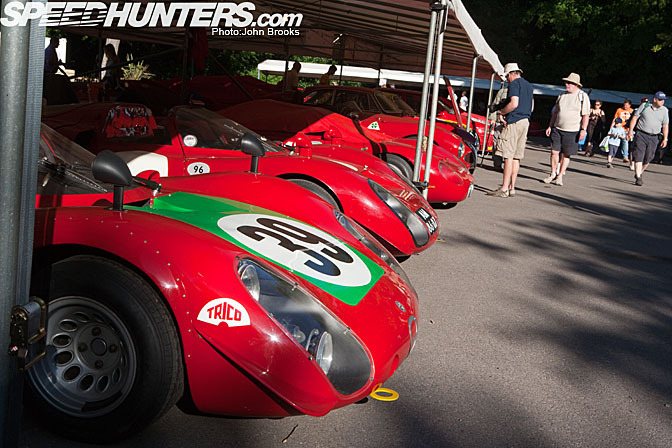 Simply Red, early morning in the Cathedral Paddock sees the T33s at rest. 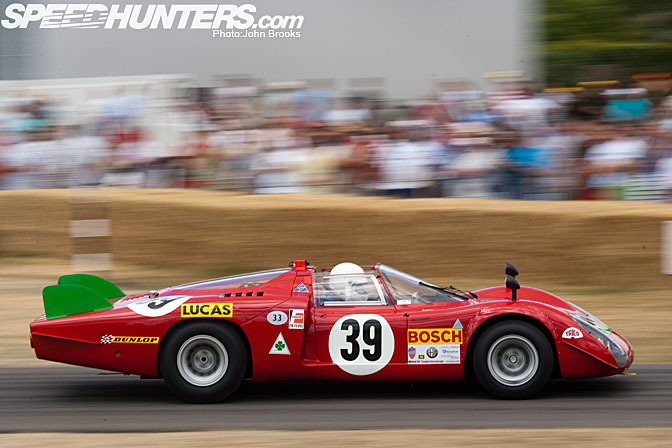 Another Le Mans veteran, the Tipo 33 TT3 that finished fourth in 1972. A classic car and a classic driver. Arturo Merzario in Alfa Romeo Tipo 159 'Alfetta'. 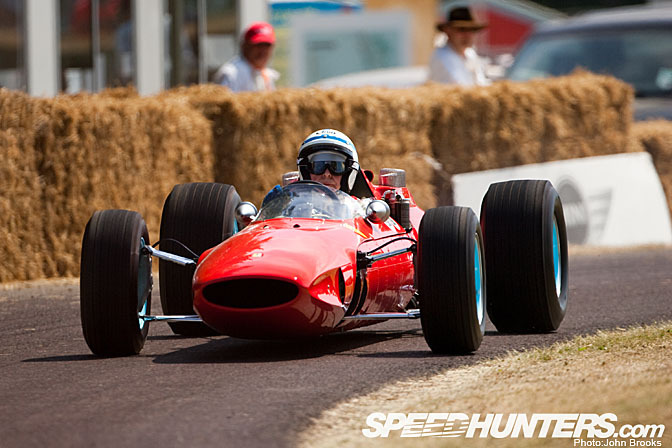 Legend is an over used term but if anyone deserves that accolade it must surely be John Surtees. 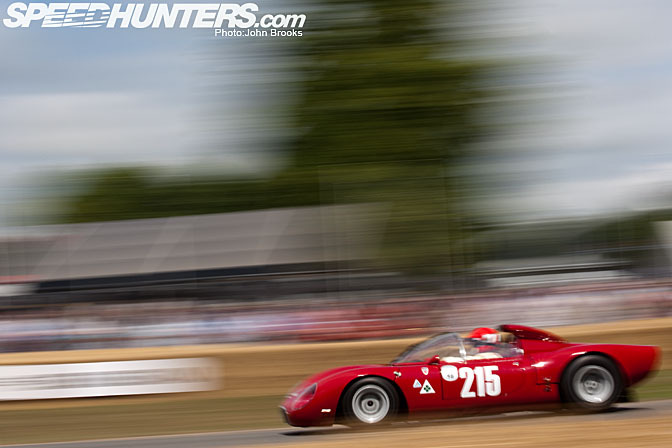 At Goodwood he was reunited with the actual Ferrari 158 he used to win the 1964 World Driver's Championship. He also won seven world titles on motorcycles and is the only man to be a World Champion in both sports. His appearance at the Festival will have been a bittersweet experience as he was raising awareness and funds for the charities, Headway and the Henry Surtees Foundation. Henry, his son, was killed in a Formula Two race at Brands Hatch last year, when hit by a flying wheel. 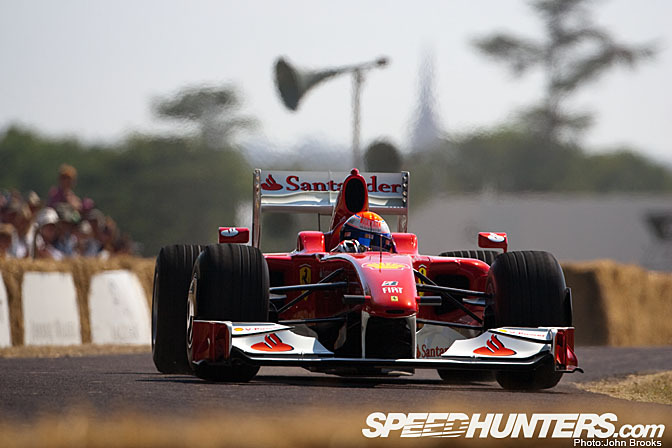 The fortnight before he had given one of his father's old cars a run at the 2009 Festival of Speed. To see and hear the reception that the fans gave to Il Grande John on Saturday was beyond poignant. 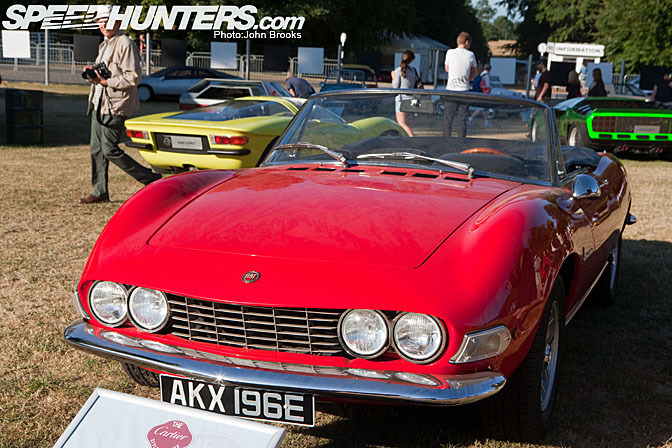 The celebration of Italian style and speed was fantastic, yet another great show from Goodwood. I'm guessing that the Ferrari F1 is last years car painted in this year livery,correct? Same as the Mercdes F1 car at the show is last years Brawn car in mercdes livery. Mister Brroks, once again you made my day. THANKS SO MUCH. I was supposed to be there but my flight was canceled and i couldnt make it in time. At least i can see what im missing! Great coverage Brooksie, love the SE 048 SP, one Id only heard whispers of, but never saw. Did any Class 1 DTM/ITC Alfa 155's appear? Mr. Brooks, I envy you so deeply..thank you for sharing! Great photos, I covered "Modena Terra di Motori" this year with this video, you can see lot of them here. The Alfa 164 Procar doesn't have the V10 mounted in the engine bay, it's ahead of the rear axle in a mid-rear Formula configuration. Awesome show. I flew over from Canada and attended all three days. You really need more than one day to see the show. I have nearly 1000 photos and an hour of video. Great coverage and photos John, and while I enjoy the way you write, I must take objection to your bastardization of the Italian language. If you insist on using words you are not familiar with, the very least you could do is make sure you use them correctly. "Piatti" is plural of "piatto" which is a masculine noun. Therefore you need the plural and masculine version of the adjective "primi" not "prima". Likewise "dolce" is also a masculine (singular) noun and should be accompanied by the singular masculine article "il" not the female singular article "la". 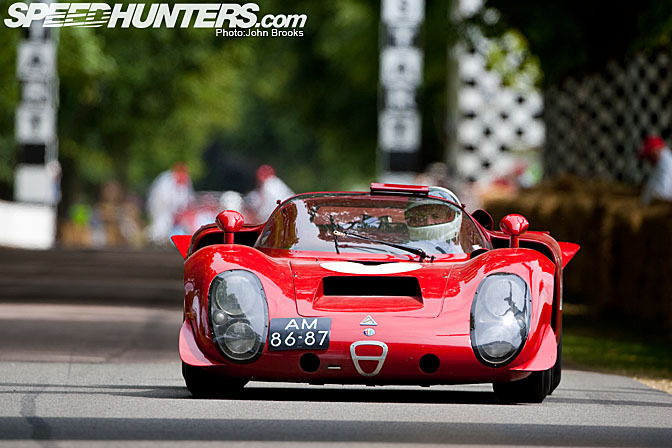 That Alfa Romeo SE 048 SP is great looking! Any chance you have more photos of it at speed?